The throttle actuator is operated by the ecm and opens and closes the throttle valve using gears. The opening angle of the throttle valve is detected by the throttle position (tp) sensor, which is mounted on the throttle body. The tp sensor provides feedback to the ecm. 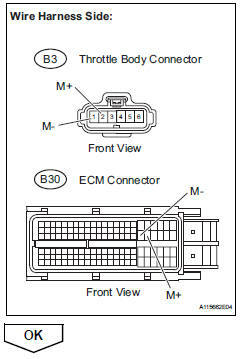 This feedback allows the ecm to appropriately control the throttle actuator and monitor the throttle opening angle as the ecm responds to driver inputs. This etcs (electronic throttle control system) does not use a throttle cable. The ecm monitors the electrical current through the electronic actuator, and detects malfunctions and open circuits in the throttle actuator based on this value. 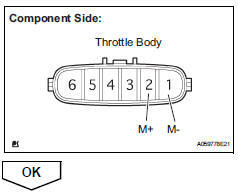 If the current is outside the standard range, the ecm determines that there is a malfunction in the throttle actuator. In addition, if the throttle valve does not function properly (for example, stuck on), the ecm determines that there is a malfunction. The ecm then illuminates the mil and sets a dtc. 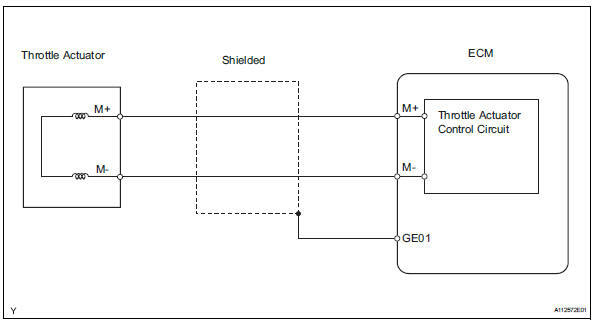 Example: when the electrical current is less than 0.5 A and the throttle actuator duty ratio exceeds 80 %, the ecm interprets this as the current being outside the standard range, and illuminates the mil and sets a dtc. If the malfunction is not repaired successfully, a dtc is set when the engine is quickly revved to a high rpm several times after the engine has idled for 5 seconds after engine start. When either of these dtcs, or other dtcs relating to etcs (electronic throttle control system) malfunctions, are set, the ecm enters fail-safe mode. During fail-safe mode, the ecm cuts the current to the throttle actuator off, and the throttle valve is returned to a 6° throttle angle by the return spring. The ecm then adjusts the engine output by controlling the fuel injection (intermittent fuel-cut) and ignition timing, in accordance with the accelerator pedal opening angle, to allow the vehicle to continue at a minimal speed. If the accelerator pedal is depressed firmly and gently, the vehicle can be driven slowly. The throttle actuator current (throttle mot) and the throttle actuator duty ratio (throtl opn duty / throtl cls duty) can be read using the intelligent tester. However, the ecm shuts off the throttle actuator current when the etcs malfunctions. Measure the resistance of the throttle actuator. Check for foreign objects between the throttle valve and the housing. Ok: no foreign objects between throttle valve and housing. Check if the throttle valve opens and closes smoothly. Ok: throttle valve opens and closes smoothly.